The new Toyota Corolla 2017 facelift is causing quite a stir these days. Toyota Indus has completely refreshed and updated the front of the vehicle along with new brake lights, upgraded alloys, and redesigned dashboard. 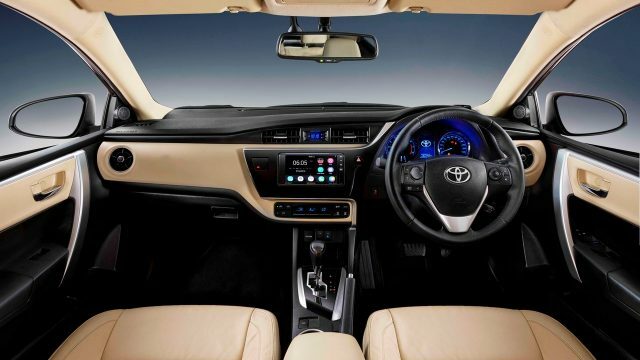 Along with the more apparent outer changes, Toyota is specifically focusing on the subtle changes it has brought to its interior (dashboard) this time around. Toyota has slightly changed the outlook and design of the new model. But keep in mind that the rest of the interior is pretty much the same. One word you will be reading and hearing a lot around the new Corolla is ‘prestige’; that is meant to show that how the new design brings and adds prestige to the new car. One can argue that this is quite subjective, but it is what it is. Toyota has brought what it is calling a ‘3-dimensional floating design’ to its new dashboard. There is the black base surface of the dashboard, then lighter cream colored second layer, and lastly the piano black polished 3rd layer of the panel on top around the center screen and climate control panel. It has been made sure that the joints and parting lines are hidden from the passengers and the light colored portion of the dashboard is made up of soft textured material. The A/C vents on extreme left and right have also been redesigned. You now get circular vents instead of triangular vents of the outgoing model. Toyota is saying it has further enhanced the meter panel and has added more detail to the whole panel. Two types of meters are available in the Corolla 2017 depending upon the variant of the car. 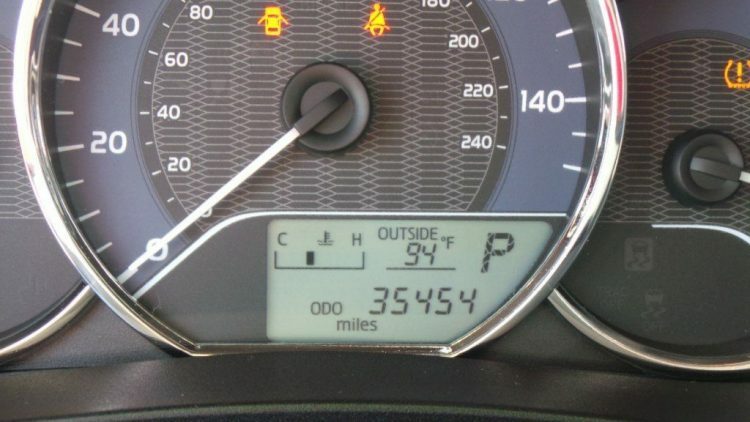 The Corolla XLi and GLi variants will come with a regular analog meter with a compact LCD in the bottom of the meter. The LCD display information like an odometer, trip meter, cruising range, fuel average, as well as information like engine temperature, outside temperature and shift position for automatic GLi variant. The higher models like 1.6L Altis AT, 1.8L Altis MT, 1.8L Altis CVT-i, 1.8L Altis Grande MT & 1.8L Altis Grande CVT-i will come with Toyota’s newly designed Optitron meter. Toyota has redesigned the graphics of the multi-information display to improve the appearance of the whole package. You get two analog meters (RPM and speedometer) and in the center, you get a 4.2inch TFT display with high definition colors. 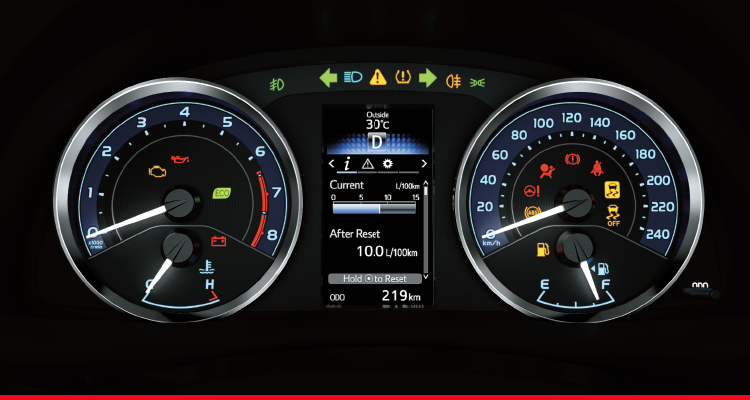 The TFT display shows regular information like current fuel economy, cruising range and eco monitor. And then there are things like messages and general setting of the display. Toyota has redesigned both the digital and manual climate control and switches in the new 2017 Toyota Corolla. The automatic panel which is only available in the new 1.8L Grande variant now comes with toggle buttons instead of regular push buttons. Toyota’s argument behind the change is that toggle buttons are not only long lasting but also far easier to use during driving. The LCD panel has been redesigned as well. The manual knobs haven’t been changed for the new model. The manual panel is available in mid/base grade Altis 1.8L MT/CVT, Altis 1.6L AT, GLi 1.3L MT/AT, and XLi 1.3L M/T variants. 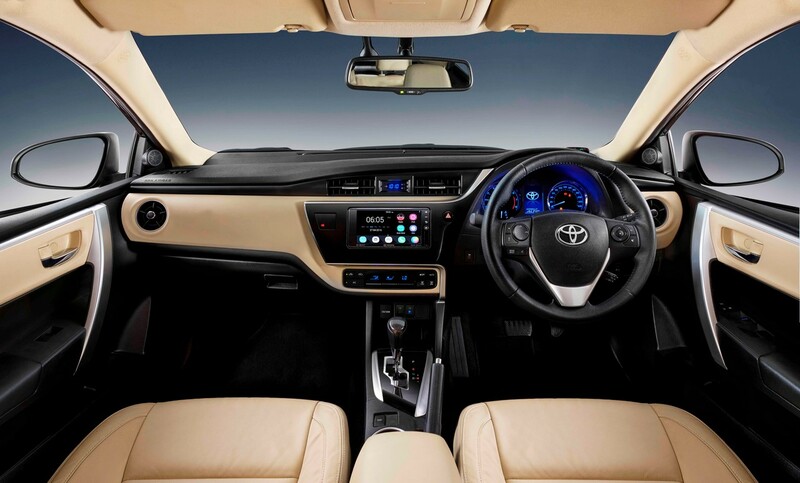 Toyota has also introduced a new 9” infotainment system in the new Corolla. The new system is running Android 4.2 and comes with a preloaded navigation system and is interactive in design with display information such as door ajar warning, trunk open warning, maintenance alert, low fuel warning, and trip travel etc. Other than that, you also get three cameras; a front cam, a reversing cam, and a cabin dashcam. Toyota has also introduced a lighter color scheme and is calling it flaxen. There are three types of materials available as far the interior is concerned; leather, fabric hi (better quality fabric), and regular fabric material. You will get leather in 1.8L Altis Grande MT 1.8L Altis Grande CVT-i, Fabric Hi in 1.8L Altis MT and 1.8L Altis CVT-i, and regular fabric in 1.3L GLi AT, 1.3L GLi MT, 1.3L XLi MT, and even 1.6L Altis AT. The departing Toyota Corolla has performed quite well for Indus Motor Company. There is no doubt the new shape Corolla will perform equally well, if not better than the current shape.